I get to write this post. I didn't get to work on a post last week because the hubby was home from work all week. Ten days of vacation time that sadly ended up not feeling much like a vacation at all after my husband threw out his back on the second day. But, he's back to work today and I can get back to my routine. No more blogging withdrawl for me! It's my birthday today. No kidding, haha. Birthday's are good days. Dinner date with my husband to look forward to tonight. It was 70° out when I woke up this morning. Now, that may seem like summertime weather for other parts of the country, but for us southern folk, a 70° morning is a sign that autumn has arrived. I happily sipped my coffee on the front porch to enjoy the cool air and watch the sun come up. I love fall. Once the humidity leaves the air and the cool crisp days ensue I feel like I am revitalized. I also love cool weather cooking. Hearty soups and stews that warm you to the core and roasts and root vegetables that stick to your ribs. There's just something about fall food that is comforting and reminds me of home. 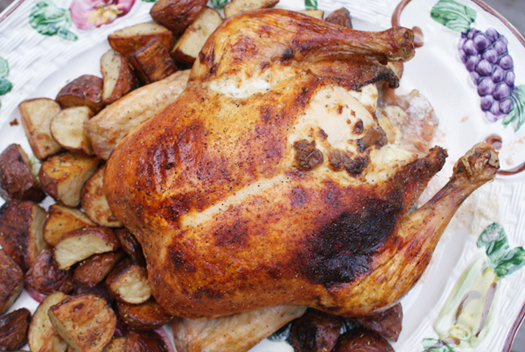 This roasted chicken and potatoes is the perfect dish to ring in the changing of the season. The earthiness of the potatoes and herbs pair perfectly with the tender juicy chicken. My favorite thing about this recipe is the rosemary cream cheese tucked under the skin. So rich and so delicious, you've got to try it. 1. Preheat oven to 375°. 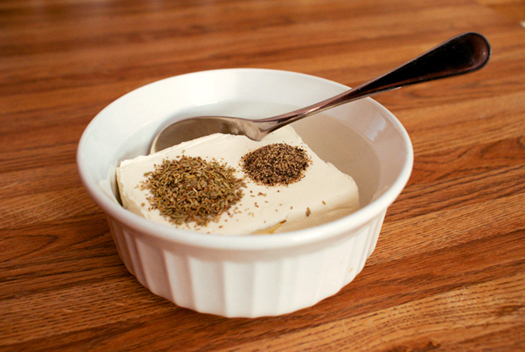 In a small bowl, combine the cream cheese, 1 tsp of the rosemary and ½ tsp of the black pepper. 2. Use the handle of a wooden spoon or your fingers to carefully separate the skin from the meat of the breast and thighs. Gently fill the area between the skin and the meat with the cream cheese mixture. I've found that a good way to maneuver the cream cheese is the place a spoonful under the skin and then spread it out by pushing it around from the outside. 3. Brush the outside of the chicken with 1 tbsp of olive oil (or just use your hands to spread it all over the skin...messier, but easier) and sprinkle with salt, pepper and garlic powder. You can tie the legs together with kitchen string (or unwaxed dental floss). I usually don't bother, but it makes a pretty presentation if you do. 4. 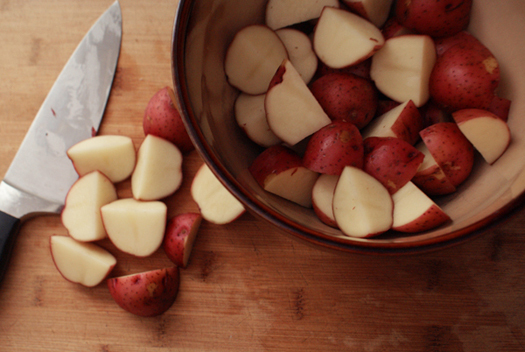 Toss potatoes with the remaining ¼ cup of olive oil, 1 tsp of rosemary and ½ tsp black pepper and spread out in a single layer on a separate baking pan. 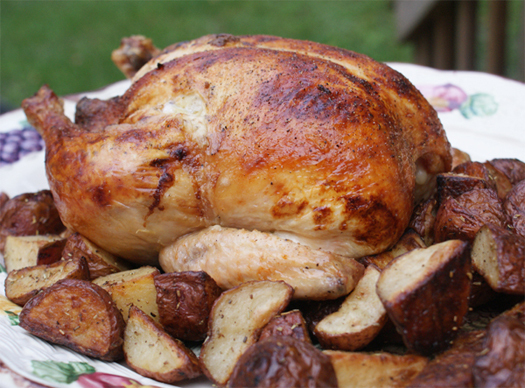 Bake the chicken and potatoes for 1 hour and 15 minutes or until chicken is 165°, stirring the potatoes every 30 minutes. If towards the end of the cooking time the chicken skin is getting too dark, loosely tent with foil for the remaining cooking time. 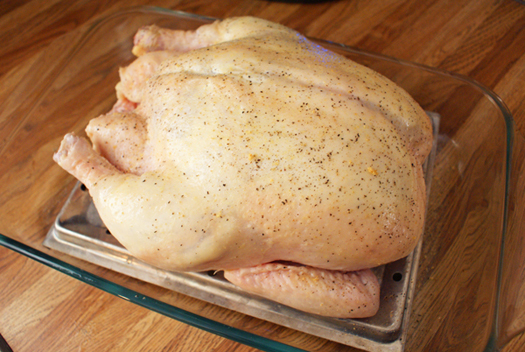 Let the chicken rest 10 minutes before cutting and serving. You can see here that I tore my skin down the center a bit during the preparation. If yours tears, you can use a tooth pick or two to secure the skin before baking in order to avoid the split. You can also see that my skin began to get dark spots which is why I ended up tenting it for the last 15 minutes or so.